KALEIDOSCOPE: Colour and Sequence in 1960s British Art looks at the radical changes that took place in British abstract art during the 1960s, with the use of industrial materials and vivid colour. It focuses especially on the growing cross-fertilization between painting and sculpture. The exhibition is broad in scope bringing together different styles of abstract art such as New Generation sculpture and painting, Op Art, Pop Art and Constructionism, with the works being mainly drawn from the Arts Council Collection. The collection is particularly rich in 1960s abstract art due to their enlightened collecting policy which saw them buy many examples of contemporary art within a short time of their production. The first thing that strikes you as you enter the exhibition is the sense of space, lightness and colour. The work is given room to breathe in the Walker’s elegant exhibition galleries. There is no sense of the art being dated; indeed, it is hard to believe that it is fifty years old. The first room sets the scene with only a few paintings on the walls and Michael Bolus’s open coloured steel fretwork sphere, 4th Sculpture (1965), occupying the central space. The large central gallery showcases a mixture of paintings and sculptures. The sculptures are featured down the middle of the room. They are free-standing without the use of plinths; a significant feature of New Generation Sculpture being that sculpture should stand directly on the floor and occupy the same space as the viewer, thus encouraging a more direct confrontation. The final room, which is divided into two spaces, continues the intermixing of painting and sculpture. This intermixing encourages visual relationships between the two; of shapes, geometry, space and colour. 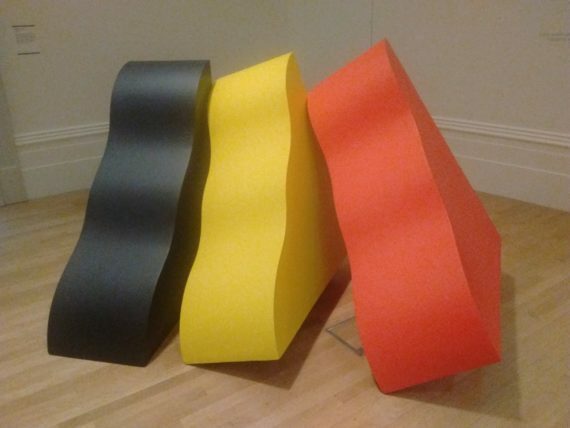 There is also the use of repetition and sequencing of forms (one of the key themes of the show), although these forms often show subtle differences in shape or changes of colour, as seen in William Tucker’s sculpture Thebes (1966) or Joe Tilson’s painting Zikkurat 7 (1967). It is clear from this exhibition that there was a closeness between painting and sculpture that would not be seen now with the multiplicity of media and diversity of styles that today’s artists employ. However, the harmony displayed by the two media in the abstract work of the 1960s perhaps prefigured the post-medium condition that we now find ourselves in. Artists were beginning to realize that there could be relationships between media that hadn’t been seen before and that perhaps they could work across them in a way that hadn’t been permissible before. This reappraisal of the art of this era has opened my eyes to the relevance of this art and the surprising freshness that it still retains.